Forgot something at the grocery store? Need your iPhone to calculate the waiter's tip? Having trouble doing the Sunday Times crossword puzzle? OK, everybody has trouble doing the Sunday Times crossword puzzle. And if you're one of those people who doesn't have trouble doing it, then don't tell me. I just don't need to know. Maybe you need more brain food. Yup. There are foods that help your boost your brian's fitness including dark chocolate, flaxseed, salmon, and tuna. Not sure how to get more brain-healthy foods into your diet? 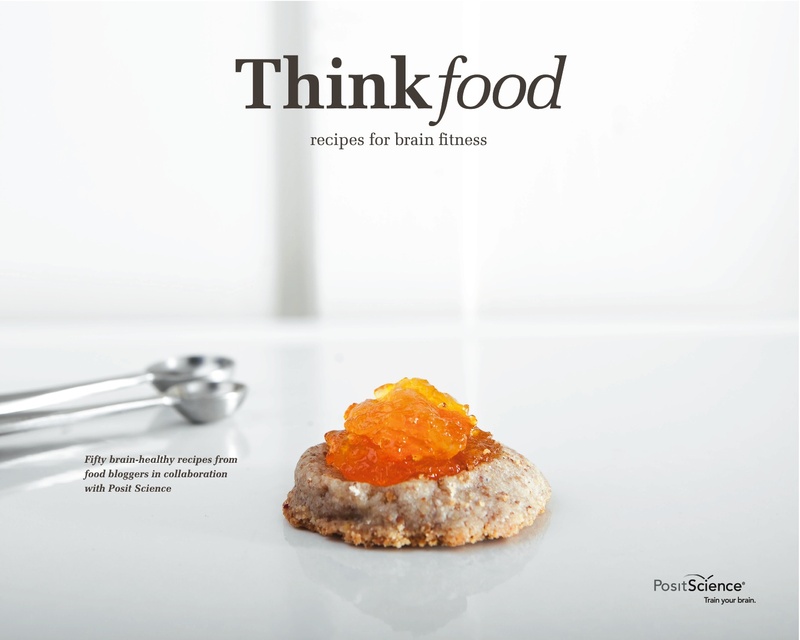 Then you'll be glad to know that there is a new cookbook called Thinkfood, Recipes for Brain Fitness. Posit Science (a leader in brain training software) joined forces with 50 bloggers, including me, to create this cookbook, featuring 50 unique, delicious, brain-healthy recipes ranging from appetizers to entrees to desserts. The cookbook won't be released until July, but in the meantime, you can sign up for their free email Recipe of the Week campaign. Each Wednesday over the next 50 weeks, you'll receive a brain-healthy recipe, meet the blogger who created it, and get tips about brain-fitness foods. My recipe will be featured in September, so I'll give you a heads up then. So before you tackle the Sunday Times crossword puzzle this weekend, you might want to power up on a chocolate croissant. I'm just saying. How great! Congrats! Love it...will sign up for the emails, for sure! Congratulaltions Susan on your contribution! wow what a great book to have contributed too, i truly believe in feeding the brain and the body! Congratulations! I love this idea and can't wait to see it when it comes out. chris-I'm glad to hear that! Hope you enjoy them! suzanne-And that's what this cookbook is all about. carrie-Thanks a lot! It's coming out next month. Can't wait to see your recipe! What a great theme for a cookbook. Besides brain-friendly foods, the process of planning a meal, selecting recipes, shopping for fun, new foods, etc. can also be challenging, engaging activities that can help boost brain functions. katherine-Thank you for telling me. I'll check them out. tom-Good point! I hadn't thought of that. Congratulations Susan! I'm signing up for the recipes now.